If you follow my blog long enough, you will know by now that I am a big fan of independent designers as you tend to be able to find something a little more unique. 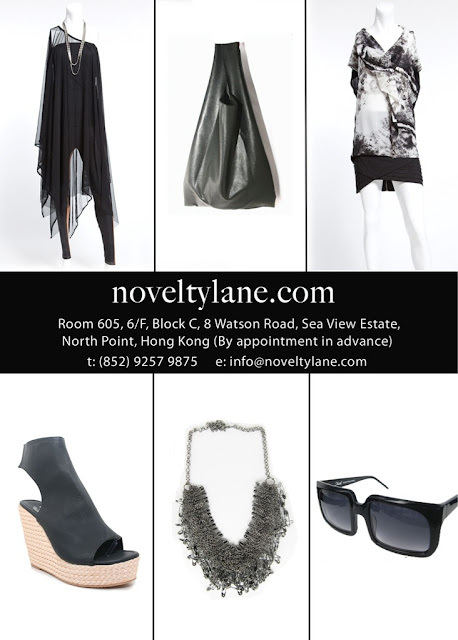 At Noveltylane.com, a local fashion website that connects independent boutiques and alternative brands all over Asia, you will be able to find 21 local fashion labels. This includes NOVIO-NOVIA, Hyperreall, Jim Collection etc. I particular like the accessories from Hyperreall and have also previously bought a few pairs of vintage glasses from McBoy. If you are looking for something more unique, Noveltylane.com is surely the site to visit. As a celebration of the recent launch of the website, Noveltylane.com will be offering StyleInk HK readers a 10% off any items, excluding Zhoezzy and Jim Collection from now till 31 December 2011. Please enter promotional code: 10STYLEIKHK to obtain this offer. I just looking through the internet for a bit of information and came across your site. I am really impressed by the information that you have on this blog. It shows how well you understand this topic.